Author(s): Suzana Brown, SUNY Korea, State University of New York, Korea. Alan Mickelson. This work presents results from a project using smart phones as a data collection tool for medical record keeping in low-resource settings. Those devices were used to collect medical data and store it as an Electronic Health Record (EHR). Background: In community care, EHR could be a bridge from untrained Community Health Workers (CHWs) to healthcare providers with timely and relevant data. Although CHWs are the backbone of health care delivery in developing countries, they often have little formal education and training. Providing CHWs with appropriate training and workplace tools could improve their ability to provide quality community based care. The field work was carried out on site in Rwanda, a country with one of the world’s lowest doctor to patient ratios, where CHWs play an important role in healthcare delivery. Objective: The study evaluates the feasibility and usability of a specific mobile health application, and compares two different methods for health data collection, electronic and paper based. Methods: The usability is measured in terms of three attributes: effectiveness, efficiency and satisfaction. Electronic data is compared with paper-based data using two quantitative measures: Mean Absolute Error and Mean Absolute Percentage Error. Results: CHWs were found effective in data collection, collecting close to 2000 records from boys and girls under the age of five. Data analysis demonstrates the evidence that these new electronic records are more accurate, consistent and accessible than the currently paper-based records. Conclusion: This study demonstrates that using modern electronic tools for health data collection is allowing better tracking of health indicators. 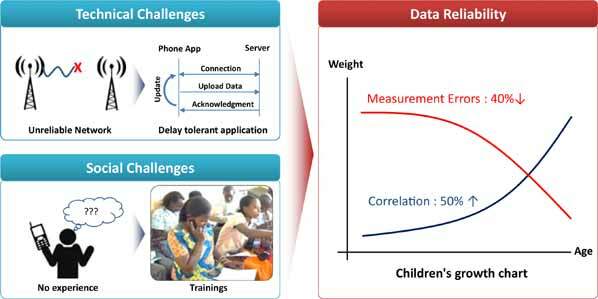 Keywords: Low-resource settings, ICT adoption, data quality, malnutrition, electronic health records. Affiliation:SUNY Korea, State University of New York, Korea. Keywords:Low-resource settings, ICT adoption, data quality, malnutrition, electronic health records. Abstract:This work presents results from a project using smart phones as a data collection tool for medical record keeping in low-resource settings. Those devices were used to collect medical data and store it as an Electronic Health Record (EHR).